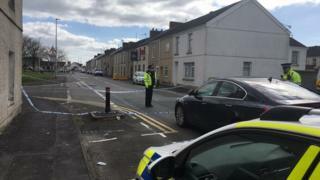 A force has referred itself to the police watchdog after officers shot a man brandishing a weapon in west Wales with a baton round. The man was taken to hospital with a wrist injury after being hit with a plastic bullet. Dyfed-Powys Police arrested him on suspicion of making threats to kill on Burry Street, Llanelli, at about 02:00 GMT on Tuesday. The man was discharged from Prince Philip Hospital and taken into custody. A police spokesman said a crossbow had been recovered from the scene. Mobile phone footage taken by a member of the public showed a man in a stand-off with police. A witness can be heard asking: "What's he doing? Why is he brandishing a crossbow?" A large area of the town was cordoned off on Tuesday afternoon, with forensic teams in attendance. Dyfed-Powys Police said it was "an isolated incident and we are not looking for anyone else". The force spokesman added: "We appreciate the police cordon closed a large area of Seaside, which caused some disruption today. "All scenes have now been released and we would we would like to thank the community for their support while vital initial inquiries were being conducted. "A police presence remains in the area while house to house inquiries are carried out. The neighbourhood policing team are in the area to provide reassurance." The Independent Office for Police Conduct (IOPC) said it was investigating the incident.